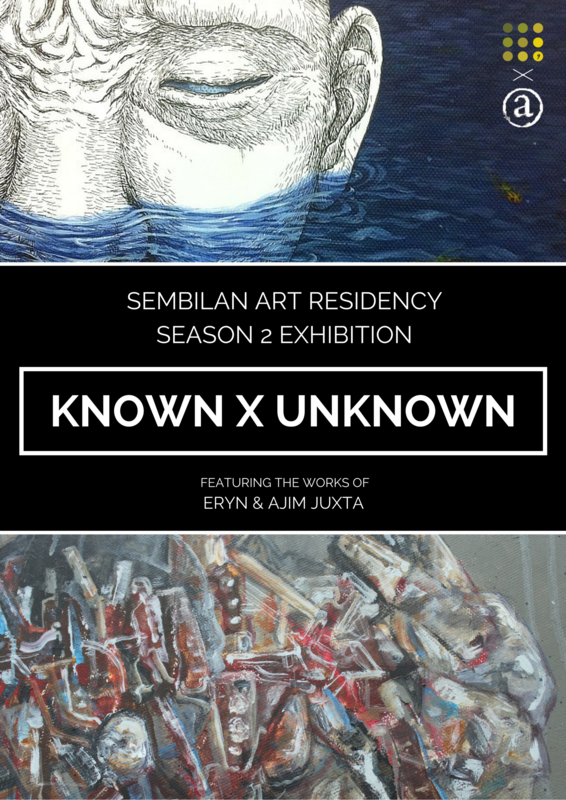 Known X Unknown presents 37 outstanding works completed by ERYN and Ajim Juxta during their time with sembilan from February – April 2015. The exhibition showcases the individual artist’s work of art and – most interestingly, two joint collaboration pieces. “Known Unknown” by ERYN alludes us to the mysteries of unknown creatures hidden within known objects that are familiar to us. With a talent in defining details, ERYN challenges the viewer with identifying realistic subjects within a surreal context. In her continual effort to find a balance between preserving her style and being contemporary, ERYN documents her observations of current worldly trends within her whimsical interpretation of nature. This relationship between nature and human in a modern world may seem obscure at first; but would be enlightening to those who allow their minds to wander and explore. 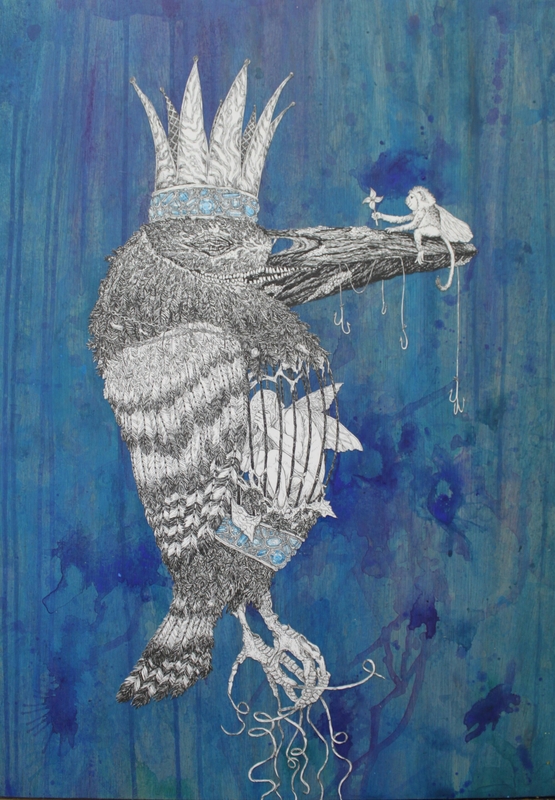 In “King of Everything”, ERYN’s detailed rendition of a decaying, embellished Kingfisher holding on to as much as he can, as his soul lingers caged in a bodily husk, tells the story of how mankind, despite being held captive within his material world, still desperately tries to enrich itself. In “Tell Me About Yourself (diptych)”, the story of a modern long distance relationship plays out within two beautifully crafted wooden panels, with detailed drawings of two beings in conversation via modern day technology. ERYN works with ink, watercolour, acrylic, intricate paper cutting on wood panels and canvases. “Unknown Known” on the other hand is an enigmatic collection of our existence. Almost abstract in delivery, Ajim Juxta deconstructs our surroundings to remind us about what makes up the city we live in – and how it in turn defines us. Components, materials and structures evolve over time, organically morphing from its man-made glory days to eventual decadence. “Kulat” and “Karat” tells of how people today are consumed by material possessions and gadgets, forgetting that these too will someday be consumed by nature’s forces of mold and rust. Ajim Juxta’s strong technique in perspective is amplified in this series, with dynamic points of views and varying degrees of dimensions visually illustrated. Humanity, and the corresponding personalities of mankind, is also explored with manifestations of individuals with multiple personalities – whether consciously, subconsciously, intentionally or unintentionally. The constant deliberation of what is obvious and what is not in our modern society underpins Ajim Juxta’s series of work. Ajim Juxta works with pen, ink, acrylic, blood (yes, blood! ), on paper and canvas. A special feature of the residency is for the artists to collaborate on two pieces of work. In Season #2, ERYN and Ajim Juxta reveal two pieces emanating from the underlying themes of both artist’s message. “Beauty in the Grotesque” and “Magic in the Mundane” depicts the gradual disappearance of the natural self, in the form of a possessed hermit and a mushrooming mind (quite literally). It tells of how, when materialism takes over, it has the power to turn us into parasites that leaches from the world out of greed. However, we simply have to look inside to seek reprieve and reclaim that little bit of peace and magic that leads to greater fulfilment. 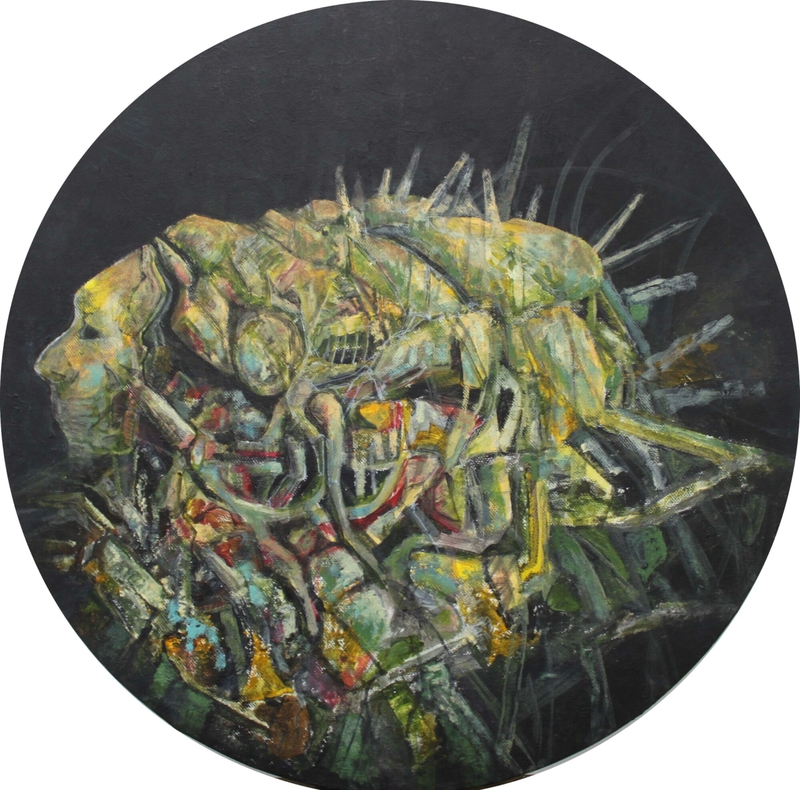 These collaborative pieces are strong collaborative pieces of the artists, produced with a great sense of artistic teamwork and mutual influences, which embodies the spirit of sembilan Art Residency Program. Known X Unknown will be open to the public from the 31st of May 2015, till 7th of June 2015. A special and unique launch event will be held on the 31st of May 2015 at 2:00 pm, hosted with a mission to promote art to new, first time collectors. Posted on May 26, 2015 by ChalkandRaddyPosted in Visual ArtTagged ajim Juxta, aku cafe, Art Malaysia, Emerging artist Malaysia, Eryn, sembilan Art Residency Program.